As the campaigns for the 2019 elections set to commence on Sunday 18 November 2018, the main political parties have started warming up to seek the votes of Nigerians in what promises to be an exciting election season. 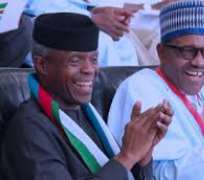 To this end, a pro-Buhari group, Coalition of Buhari/Osinbajo Movement (COBOM) has advised Nigerians to shun fake news, disinformation, and outright falsehoods in other to have an issue-based campaign. This is contained in a statement signed by the group’s Chief Political Specialist, Olalekan Adigun, today in Lagos. We read the so-called PDP’s “Campaign Strategy” document like most Nigerians online and we must admit our initial disbelief at the receipt of the document. This is not because we are surprised that the integrity-deficient PDP can just suddenly be washed clean overnight, but because we feel any party that still has an iota of decorum in it should have disowned the document and distance itself from such devious contents containing outright attempt by a party to anchor its campaign on simply disseminating falsehood in a desperate attempt to capture power. We will not ordinarily have bothered to join issues with a party which has struggled to purge itself of corruption and repent from looting but we think we have to set the records straight because the party’s “strategists” like Femi Fani-Kayode and Reno Omokri are well-known disciples of Adolph Hitler’s minister of propaganda, Joseph Goebbels who shares the belief that when lies are told consistently and boldly, the people will soon begin to believe they are true. We are not, therefore, prepared to reduce ourselves and our presidential candidate Muhammadu Buhari to their level of gutter fight. It is clear the party well-known for its trademark fake news has not learnt much from its 2015 debacle when it deployed all orthodox and unorthodox means of disseminating fake news, including hiring [for millions (billions?) of dollars] local and foreign mercenaries, including the notorious Cambridge Analytica, in 2015, to spread disgusting videos with the hope of swaying Nigerians from voting for Buhari. We wish to remind the opposition party thathistory often repeats itself – first as a tragedy and later as a farce. While we read, we decided to wait for 48 hours in the hope that PDP still has some decency in it. But we were proven wrong. Rather than PDP leaders disowning the unfortunate document, their actions went further to validate its contents. Immediately its presidential candidate, AlhajiAbubakar, landed at Abuja Airport, the party demonstrated its campaign will, in fact, be based on fake news. The Atiku’s “alarm” at airport security official’s routine search of his private jet and entourage show is one of the ways, in our opinion, the party intends to show it cannot wait to execute their evil plan. We also read, with dismay, the coordinated efforts at the spread of “negative and fake news relating to the VP; Prof.Osinbajo, who is the main poster child of the administration and the most vocal opponent of the PDP” [as the document claims] in the past few days. We wish to put Nigerians on record that the PDP has no single record or issue to campaign to campaign for votes, hence, their decision to resort to misinformation, disinformation, and fake news. COBOM, on its part, would have felt proud to disown the document if such is ever linked to President Buhari [even in its remotest possibility] whose integrity dwarfs everyone, including AlhajiAbubakar its candidate, in the PDP. The PDP admitting the contents of the document convinces us that even though it boasts of having in stock more dollars than there are in US Federal Reserves, integrity is still too expensive for the party! While we are still hopeful that the party join us in COBOM for an issue-based campaign, if there is still an iota of integrity left in it, we urge Nigerians to shun resource-depleted PDP’s new low attempt at staging a coup d’etat through monstrous fake news, hate mongering, and outright disinformation which seem like the only means through which the party can survive in the 2019 presidential campaign. They have nothing to offer the masses other than a return to the party’s better-forgotten, dark, and looting-spree 16-year reign which Nigerians have put behind them. We, as a group, will be running an issue-based campaign for President Buhari’s re-election in 2019 through personal communications and direct commitments with masses living in the rural areas and cities through our field officers in all 774 Local Government Areas. We will hit the streets in the coming days armed with the verifiable achievements of the Buhari administration in Agriculture, Transportation, unprecedented Infrastructural developments (especially in the rail system) and pro-poor policies like Npower, Home Grown School Feeding Programme, Clearing of Pension Areas for Senior Citizens, Trader Moni, the fight against corruption, and many others. A good “Campaign Strategy” should be based, not on fake news, hate mongering, and disinformation. We believe with these, Nigerians will witness the biggest endorsement of an incumbent re-election in the electoral history of the country in a free, fair, and transparent manner.